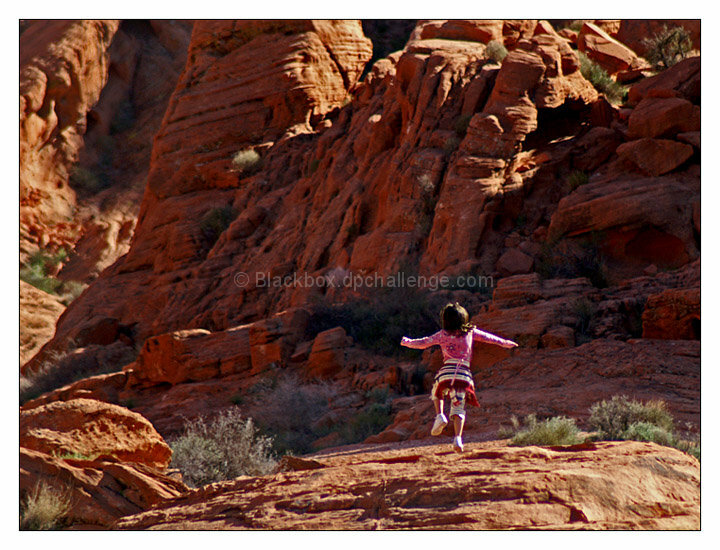 Wonderful capture of joy in (and perhaps stimulated by) a striking environment. I saw several children spontaneously dancing and jumping happliy in similar setttings last week. To me, the setting is just as important as the dancer. Having a shot that does not include a face allows the viewer much lattitude in creating internal stories about the image. I was unable to vote in this challenge due to travel in red rock country of southwest Utah -- but the trip helped me appreciate your entry. Riff on "Rolling Stones" a welcome extra touch. Wonderful capture. Nice highlights along three sides of the picture and on the dancing subject. Beautiful color and such a cute little skip! Nice image. I like the sense of depth. The idea is very good, but I think you could limit this photo alot. Girl dancing in a soft lit room may be brilliant and get bunch of 6 and 7. This doesn't quite make it there, due to disturbing background and to small motive in my oppinion. Also, the backside of a girl/boy, any person or animal is not that excitiing. Sometimes it may though. Proudly hosted by Sargasso Networks. Current Server Time: 04/20/2019 06:59:00 PM EDT.